What did the disciples use to anoint sick people? SPECIAL NOTICE. 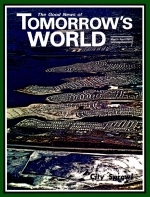 FOR the next six months TOMORROW's WORLD and The PLAIN TRUTH will be issued bi-monthly. Important developments have led to this temporary change. It is due largely to unexpected and unprecedented GROWTH in the circulations of these magazines. This very success evidences the fact that people worldwide are HUNGRY for the priceless things we are able to give. This is fulfilling the GREATEST NEED in the world today! I'm going to take you into my confidence, and inform you of the facts. Beginning July, 1968, we launched a worldwide circulation drive for The PLAIN TRUTH. At the same time, we changed the editorial format. It became secular in appearance and language. Yet still giving out the wonderful knowledge of the true values and goals in life, the WAY to the better, richer, fuller, more abundant life.